Each week the WMG podcast features a story from their Fiction River original anthology series. 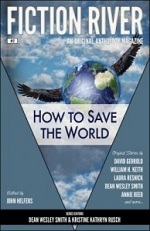 “The Shape of a Name” is one of the stories in Fiction River #2: How to Save the World edited by John Helfers. There are some truly kickass stories in this anthology. It’s available now in print and ebook, and an audiobook of the entire volume will be available in a couple of weeks. Cool beans, right? Two Free Fiction Thursday stories by me in one week. What a deal!